We are always adding new items to the collection through purchase and donations. Map Guides to German Parish Registers (46 volumes), published by Family Roots Publishing. A staff suggestion to fill a need for genealogical coverage of German ancestry. History and Genealogy of Peter Montague of Jamestown, Virginia 1603-2003, which recently won an NGS award for excellence: this purchase came from a notification from the author. Litchfield: the Making of a New England Town: purchased from the Litchfield Historical Society, this book is a colorful and richly illustrated history of the town. Hills, Bourquin, Burns and Related Family Ancestors by Thomas D. Hills. Donated by the author. Bickford Families in 1790 – Massachusetts by Glenn D. Nasman. Donated by the author. Sandisfield: an Intimate History and Some Comments, written in 1948 by Elizur Yale Smith (1885-1950); manuscript edited and prepared by Bill Price, 2014. Sent in a limited edition to some libraries and genealogical societies. Clan Donald USA donation – In addition to individual books, we also receive collections from individuals and societies that enhance the collection by providing a number of items on a specific subject. We added almost 100 titles about the family and clan history in this period. 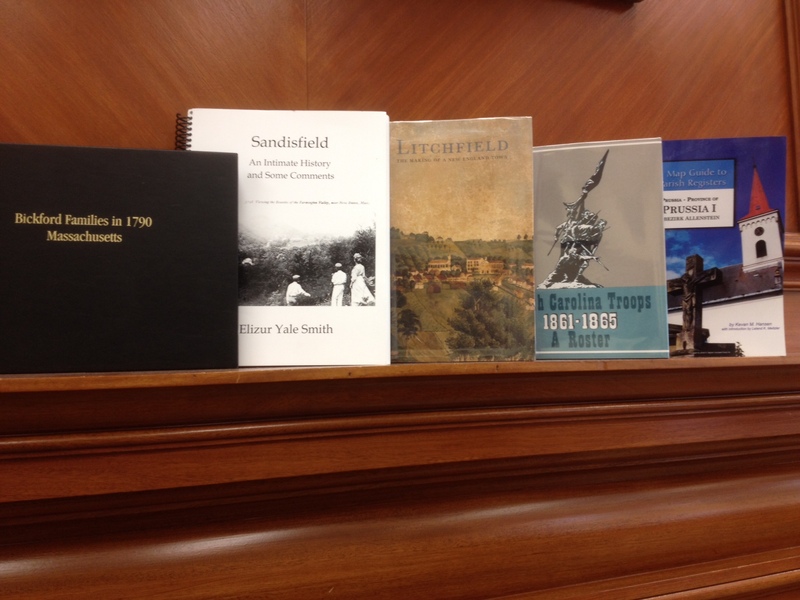 As you can see, the library strives to have a diverse and expansive collection, and accomplishes this through focused purchasing of relevant works and through the generosity of members and friends of the Society.